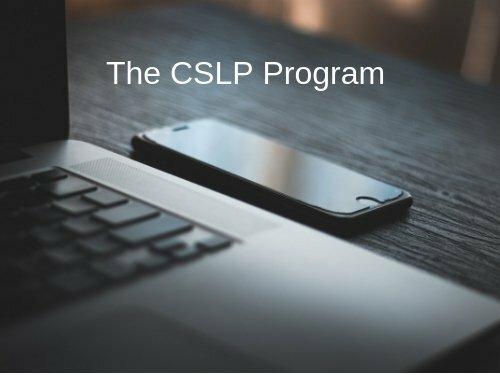 The CSLP program course includes all of the audio-visual modules, resources, forms, documents, and access to the CSLP exam. This version does not include CE CFP credits. For CE, choose the CSLP Program course with CE Credits. The Certified Student Loan Professional (CSLP) program is a comprehensive training and specialty designation. It is exclusively for financial professionals who serve clients in areas such as financial planning, tax advisory and preparation, investments, insurance, and retirement planning. The typical roles are CFP, CPA, EA, and RIA. The CSLP Program consists of a series of self-paced audio-visual presentations on each topic. Comprehension tests are included after most modules. Participants can move through the program and course modules at their own pace and revisit at any time. The Resource Library includes items such as client forms, handouts, and other related documents used in the advising process. Participants work within a learning management system (LMS) where progress can be easily tracked. A support system is also included to engage with the instructors as needed for questions and clarifications.